She is one of the best actresses in Hindi cinema, and you have seen her in some brilliant films, like Dil Se (her debut), Koi Mil Gaya, Lakshya, Kal Ho Na Ho, Veer Zaara (a personal favorite), and so many more. Of course, we are talking about the great Preity Zinta. The lovely actress has been missing from the silver screen for several years because she took a cricket sabbatical, but now fans can rejoice because she is back with Ishkq in Paris. 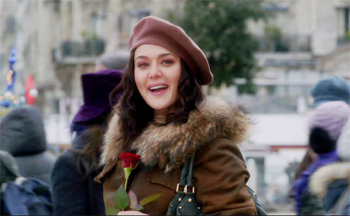 Preity not only stars in the film, she also produced the rom-com, which is directed by Prem Soni. I got the incredible opportunity to chat with the actress, and even though it was almost midnight and she was at the airport getting ready for an all-night flight, Preity was amazing to talk to. The whole time I was talking with her, while I was doing the transcript and while I was writing this article I was smiling, and I am sure you will be too while you are reading it. Check out what she revealed about the film in our laughter filled conversation on all things Ishkq in Paris, including who she says thanks to and what I better do! Intrigued? Read on! What made you decide to go into producing and make this film? Well, it was the fact that I had done 26 films and there was a time when I was doing films non-stop and suddenly, I just felt, ‘Okay, now what? I need to do something different’. So I went into cricket. Now cricket was a choice, which felt absolutely natural and normal to me, but crazy to everyone else. Then after a couple of years in cricket, suddenly one fine day, sitting next to the Dalai Lama, it just came up to me that I want to do a movie. I was talking with my business partner and I said I want to do a movie. He said, ‘I think you should produce it’. I was like, ‘Why would I want to that?’ He said, ‘Look, how much money have you made in entertainment? I am sure you must have made money out of entertainment, so why don’t you invest back? Think of it as a reinvestment and just do it. If you think about it your films are made from your heart. I was like; ‘Yes, I think I will do it.’ That is how it all started. Tell us about creating the story of the film. My character is called Ishkq; she is half Indian-half French. She is a fashion photographer. There is a certain depth to her. She is not just a frivolous character. When they talk about her in the film, they say she is a photographer. She loves photographs – they are perfect. They always remain perfect; they don’t change with time. Just that line see, gives her a lot of depth. She is of the generation today, you know, which is very technology savvy, very social, but through the internet – let’s say, through Facebook, through Twitter. The world is getting smaller for them because they have friends all over, but at the same time they feel a bit lonelier. Very career oriented. She is not looking for love because probably she has fallen before. So not to be a perfect kind of heroine, she is a more real kind of character who is slightly imperfect. I think, as a story, we have attempted to write something that is contemporary, which reflects very much today and also, of course, be fun and entertaining, because it is a romantic comedy. But also have something for people to take back from there, you know? Something positive, because film is such a powerful medium, it influences people. So we wanted make a film or we tried, we tried to make this film, which is fun but also something that you would take back with you. Tell us about shooting in Paris. Starring opposite you is Rhehan Malliek, and Ishkq in Paris is his first film. What was it like to work with a new actor and what was it like to work with him? Very tough – in a good way. I don’t want to lie. You know what I did after the first three days of shooting with him? I called Shah Rukh, who was the first actor I worked with, and I called Manisha, both of whom I worked with in Dil Se. I called them and I said, Thank you. Thank you for being so wonderful to me when I was a newcomer. Because I realized how much work you have to do when you are working with a newcomer. You know acting is talent, definitely talent, but it also is talent fused with technique. You can give the most amazing shots, but if you don’t understand the technique: like where and how you have to stand or if you are not in the light with the way you are facing, the camera can’t see it… all those secrets you have to know. These are things you have to learn on set and it is difficult. Somebody has to be very graceful and help you with that. For me I was VERY lucky to have Shah Rukh and Manisha, they were so amazing with me. Rhehan, I tell you, he has done so well in the film. He has picked up things, he has been like a big sponge. The only good thing about shooting in the cold in France is a). It looks stunning on film and b). Rhehan did his dialogues in one take or two takes! He was so cold that he just wanted to get it right. (Laughs) He was so focused, I can promise you, because he was sooo cold! (Laughs) He would look at me and he would say aren’t you cold? You are wearing a skirt, aren’t you cold? I would just look straight into his eyes and say, ‘Rhehan, it is 42 degrees and I am feeling really hot! Mind over matter!’ He would just look at me and not say anything after that! But, I was SO cold! You expect to be 0 degrees, -4 degrees, you don’t expect -20 degrees. It stuns you! The first day was -23 degrees and that is how I like to say Ishkq in Paris started. Tell us about working with the French actress in the film, Isabelle Adjani. Oh My God, she was awesome! I think I have known her from some life before. We sent her the script and she said, Yes! (Preity’s voice rises on this!) For her to be a part of this film, she is so graceful, so beautiful and so wonderful. I was just over the moon! She is gorgeous and she is such a great actor, it was amazing to share screen space with her. She is so, so sweet – just wonderful. What was the brief you gave Sajid-Wajid for creating the music of Ishqk in Paris? Sajid-Wajid are so amazing, I can’t tell you. They are so talented. First of all, I have to send out a thank you for Salman Khan, who I LOVE dearly. He is one of my closest friends. He’s so wonderful! He taught me how to do a music sitting. I didn’t know how to do a music sitting. He called Sajid-Wajid to his home and also me and my brother. At 10 pm we sat down and at 5 am we had done just 2 songs, ‘Saiyaan’ and ‘Kudiye Di Kurti’. ‘Saiyaan’ is song that is just so beautiful. It is our tribute to Nusrat Fateh Ali Khan Saab. It is very Sufi. If he was alive, I would have definitely gone to him and said sir, please sing it. But Rahat has sung it and he has done a fabulous job in that song. Every time I hear it, it just stirs and pulls something inside me. It is a very moving and very powerful song. Then there is ‘Jaane Bhi De’, which is the love song ballad. It is really, really beautiful. It is a song you can sit in the car and drive and listen to it. It is the song to sit with that someone and have a coffee: not being able to say something you want to say and we both know what you want to say… it is that moment, you know? There are certain moments in life that are beautiful, really beautiful til you accept them, you know? ‘Jaane Bhi De’ is a song for that. Then there is the club song, which is ‘It’s All About Tonight’. That is about every night. It just says Tonight is every night! It is the first time of a mix of French/Indian music, of course adapted to Bollywood sounds. Sunidhi Chauhan has sung it and she has been incredible. I mean Sunidhi is Sunidhi; I don’t have to say much about her. She ROCKS! That is a real party song; it has a very European, very club sound. Then there is the song, which I think is the song of the album, which is ‘Teri Choodiyan Da Crazy Crazy Sound Soniye’, which is a mad Punjabi, up-beat, peppy wedding song. I reckon it is going to play at all the weddings. And last and not the least is ‘Kudiye Di Kurti’ with Salman. What I am going to tell you has nothing to do with the song in the film, but there is a time when it was so cold and we were SO freezing and people would look out their windows and say who are these crazy people out in the cold. They would say what are doing? And we would say Hi, we are making a movie and we are from India. They would go “Bollywooooood (she says with French accent, I really wish you could hear this -ed) I love Bollywoooood.” Everywhere we went in France, they would say, “I love Bollywoooood.” So we put that in the song. It is the whole essence of loving cinema and loving my films. Of course Salman is… he is beautiful in it. He is gorgeous! He danced and smiled! He Rocked it! What are audiences going to love about Ishkq in Paris? I hope its originality. When Prem and me started to write the film, there were three points that I put down and said to Prem, this is my wish list. A). It should be an original story, original screenplay. I don’t want it to be inspired or based or copied from anywhere. There is a lot you can pull out of life; there is so much there so let’s make it original. B). I wanted it to be dignified and respectful. I didn’t want it to be tacky or cute or have double meanings. I wanted it to be for the family, you know? I have little nieces and nephews and kids, they have strong impressions so I wanted a film that I could bring and it be for the whole family. C). It has to be very contemporary and reflect 2013 and the kind of love you would find today and the kind of people you would find today. Be really true to who we are! What are your thoughts on Hindi cinema today? Hindi cinema has changed a lot. It will always keep changing because it is growing and there are so many different kinds of fans we have of Indian cinema. One point of Hindi cinema is it is very escapist, very large, very hero-worshipping, grand and crazy. It is just fantasy. People, they have tough lives. Of course, there are a lot of rich people in India but there are a lot of people that are very, very poor. And for them, they want to escape from their lives and their hardships and cinema is what does this for them. So there is cinema for them. Of course there is a lot more contemporary cinema coming up, younger filmmakers who are experimenting with things. That is the very exciting part of Indian cinema as well. There are so many angles and so many movies; it really is incredible how many movies this country makes! A message to your many fans? The 24th of May is when the movie is coming, please go watch it! I would LOVE to hear your opinions! Good or bad, I am happy to hear everything. This is my baby. I am a little nervous, but it is for all the people to enjoy. You don’t have to leave your brains behind! You can take your brains with you to see the movie and your wallets of course. (Laughs) You have to buy your tickets! (Laughs) I am excited that it is now coming out for the whole world to see. I hope you all will like it. Saying thank you, it was fun to chat with you after this crazy, hectic long day; the actress was off to catch her flight. But before signing off, she said one more thing to me: Now remember the movie comes out on the 24th and you better see it. Because the next time I talk or do an interview with you, I am definitely going to quiz you and if you fail, then God Help you! (Laughs) So you better watch! (Laughs)! So, after promising I would, I know where I will be tonight, seeing Ishkq in Paris! You should too!